In todayâ€™s blog I tackle common concerns I hear from marketers, social media mavens, and business owners with using new media (experiential content) in 2019. I explain more about how your business can start using new media TODAY to send your engagement, brand recall, and interactivity into the stratosphere. Hello my people. ðŸ‘‹ Welcome again to the only home for new media digital strategy on the webs. In 2018, the Beaumonde team helped businesses big and small use new media to build hype, book services, sell tickets, tell deeper stories, and more. In 2019, I want to help YOUR business do the same thing (but even better of course). In the new year, the best advice I can give you is this: New media storytelling and digital marketing can ðŸ‘�workðŸ‘� for ðŸ‘�your ðŸ‘�business ðŸ‘�TODAY. When Iâ€™m exploring ideas with clients I often hear one or more of these three concerns: Price, Time, and Effort. Letâ€™s talk about them now. But as VR/360/AR content tools and production techniques continue to evolve, so has the process for making these things. Even if youâ€™re up on your VR industry game, you probably didnâ€™t realize that there are many more affordable options in 360 content beyond blockbuster budget 360 VR video content. In a major case study from Omnivirt (after serving over 700 million 360Â° ads), 360 display ads outperformed flat display ads in some key areas. And guess what? 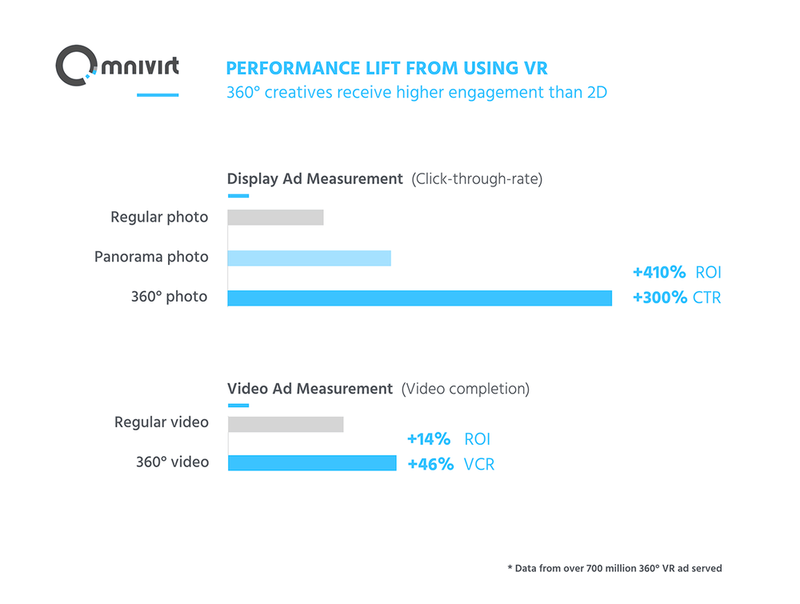 360 photo actually performs ~6x better than 360 video in display ads (which itself performs 46% better than flat video ads). What does that mean? It means the content that is easier to produce is actually performing better than the content thatâ€™s potentially more costly to make. Our support means that your existing creative can easily become 360 designs with 300% higher CTR, without needing to do any extra work. Our beta pricing starts at $2500/mo, which is an incredible investment considering the difference our content makes for your KPIs. So you should feel reassured. You donâ€™t need to blow the budget on something crazy. You can start with simpler 360 creative including virtual tour photos, 360 designs, 360 event invitations, and more. Plus, what youâ€™ll be sharing is a completely new way to tell stories. Your audience will be wowed, your competition will be worried, and your bottom line will feel the love. Feel better about the price discussion now? Want to talk to me about where 360 can fit into your content marketing in 2019? Email me ðŸ‘�right ðŸ‘�now: email Shep. When you work with the right team and the right idea, producing new media content can actually happen as quickly as any other design or content process. An experienced team has their best practices and standards already established, meaning they have the expertise to cut right to the essential elements and start work from there. At Beaumonde, Iâ€™m pretty confident that my efficient team ships quality projects faster than any other new media team out there. This means our clients have more of their most valuable resource: their time. You might ask yourself, what makes us the most efficient? Does this mean the work is a lower quality? Trust me my friend: we donâ€™t compromise on quality. Thatâ€™s not the way. We work quickly because weâ€™ve mastered the art of the MVP (minimum viable product) in new media. Clients that work with us donâ€™t need to worry about crazy time scope on the production endâ€¦ our creative direction yields concepts that are simple, engaging, and interactive. People donâ€™t need to download anything new to have the experience. It just appears for them, whether in a timeline, a news article, a website, and suddenly itâ€™s magical. In a nutshell, Minimum Effective Dose refers to the smallest dose that will get the desired outcome. In the case of creating experiential content with new media, the desired outcome can include better engagement, brand recall, interactivity, etc. In the end itâ€™s all about creating a unique experience that drives better results. Through dozens of 360 campaigns & projects weâ€™ve learned what that minimum effective dose is for experiential mediums like 360 content and AR. It may surprise you that it doesnâ€™t have to be a mind-blowing concept or deliverable to get serious engagement. My team has created a system that lets us turn around really awesome, elegant 360 concepts in a fraction of the time that big studios can do it. Plus, because we work smart and fast, the work costs our clients less to produce. You get the same results from our content (wow factor, increased engagement, better brand recall) in a faster timeframe, for a more reasonable cost. Weâ€™ve turned around killer projects with short deadlines, and weâ€™ve also worked hand-in-hand with teams to meticulously build the perfect concept. If you feel like your concerns about time are no longer an issue, then letâ€™s talk about how 360 can work for you in 2019. Look man, I get it. I run a startup and I have my own creative side hustles. When your team is stretched to the limit, you donâ€™t want that cool new idea to be the reason your big deliverable gets delayed. Sign off on the finished product when weâ€™re done. Our in-house designers and strategists have experience working from an existing creative asset or brief, as well as generating our own concepts for clients. We all get together, pick the right idea, and then we create 360 content that is fun & exciting to explore while also being informative & compelling. Because weâ€™ve designed and tested so many different concepts in 360, we understand how people interact with the media format. This means we can deliver your message more effectively through the content we create. The 360 designs we make are some of the first creations for web & social that are crafted and optimized based on first-hand insights. Our UX is always improving as we test content with more audiencesâ€¦ if you started today without that pre-existing knowledge it would take you a looong time to figure out the best practices weâ€™ve already discovered. Hereâ€™s my 2 cents. Itâ€™s really worth it for you to start using experiential content in 2019, and it doesnâ€™t have to be hard. Just plug in with Beaumonde, where pretty much all the additional effort of new media marketing is off boarded to my team. You get awesome content that is arguably a more effective marketing vehicle than anything else youâ€™re creating, and you didnâ€™t have to do any of the heavy lifting. Ready to jam with me on why 360 content with Beaumonde is your smartest choice in 2019? Email me ðŸ‘�right ðŸ‘�now: email Shep. Well cheers my people for making it to the end here. I hope this was insightful for you. If youâ€™re interested in working with Beaumonde in 2019, then you can reach out to me at shep@hellobeaumonde.com with any more questions or concerns you may have. If youâ€™re ready to work together and you want to learn more about getting started, Iâ€™m here for you. Letâ€™s chat! As I mentioned above, our beta pricing currently starts at $2500/mo. Thatâ€™s a great price for the amount of lift youâ€™ll see in your KPIsâ€¦ And it even goes beyond your quantitative metrics into the qualitative: your customers will really feel like your brand is innovative and fresh when they see this experiential content. If this is something youâ€™re interested in trying out, Iâ€™d love to make it happen. New media is seriously moving the needle for businesses out here. My goal is to make tapping this opportunity the EASIEST thing you do all year. Iâ€™m a songwriter and strategist in Raleigh, NC. Obsession is probably the right word for my fascination with new media storytelling. I lead the Strategy team at Beaumonde where we are defining how VR, 360, AR and 3D content creates opportunities for storytellers and marketers in culture, music, and entertainment. Letâ€™s create something awesome together.